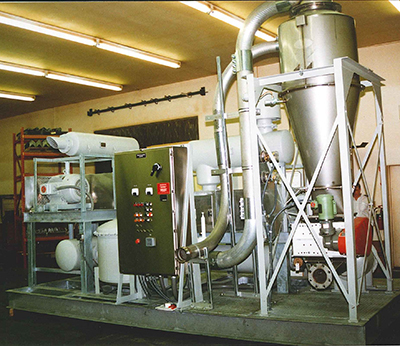 In partnership with Horizon PSI, we offer pneumatic conveying and dust collection systems engineered for your exact application. Our collective team can help recommend and supply any replacement components for existing systems or design a new, complete turnkey system per your requirements. Strict OSHA and EPA regulations continue to impact dust exposure limits and atmospheric emissions. Collection of dust from various industrial processes must be taken seriously to not only avoid contamination issues, but also to eliminate the potential of combustible dust hazards. Pressure systems push materials through the piping by applying compressed air at the system’s intake. Vacuum systems pull the material through the piping by applying an effective vacuum at the delivery end of the system. Both pressure and vacuum systems can be used for dense phase (high pressure/low velocity) or dilute phase (low pressure/high velocity) requirements. Air pollution control is an essential part of creating efficient and eco-friendly systems. Typically found in dust collector systems, but present in a variety of others (power plants, steel mills, large bakeries), bag houses remove particulates from the air or gas released from various processes. 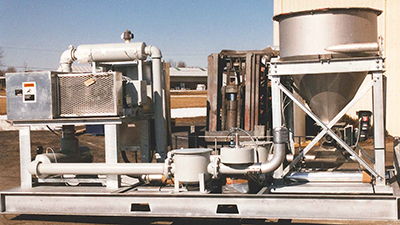 Bin Vent Filters are useful when venting dust-laden air from pneumatic conveying systems, storage silos, work bins, mixers, etcetera and are efficiently designed to mount directly onto the piece of equipment that needs venting. There’s nothing like using gravity to help get the job done. 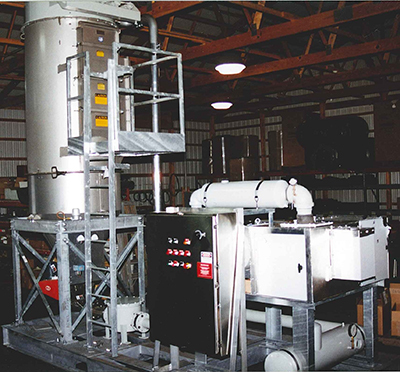 Cyclone separation removes particulates from gas, air, or liquid without needing filters, bags, or other forms of sifting by creating a tornado inside of a conical container and forcing the particulates to drop and separate from the air. Many materials are shipped in bulk bags and easy loading, dispersing, and clean up are essential for an efficient process. Fork Lift Load or Self-Contained Monorail Load bulk bag discharge systems are available, as well as, material flow aids to provide for bulk bag management. Bag dumps are manually operated and require a worker to physically lift and cut open the bag. Two options – one with an integral dust collection system and one with a remote dust collection system. Derived from the Greek word siros, silos are structures used for storing bulk materials: grain, coal, cement, sawdust, woodchips, the list goes on and on. Silos can be towers, bunkers, or bags. If you’re in the business of bulk goods, chances are, you need somewhere to store them. Let us help you get your materials into those silos efficiently and safely. Designed to help you load, weigh, and transport bulk goods such as cereals, dry goods mixes, etc., a hopper scale can be customized to your batch-weighing needs. They’re designed for continuous and accurate flow for packing, transport, and other applications. Typically used in more high pressure applications, a filter receiver is meant to intake product and separate the material from conveying air. Often used in food materials, this can be utilized in a variety of applications as well. SVE systems are designed to efficiently remediate a targeted area of contaminated soil by applying a vacuum to the soil. This process induces a controlled flow of air to remove both volatile and semi-volatile contaminants from the soil. The gas leaving the soil may be treated to recover or destroy the contaminants, depending on local and state air discharge regulations. No matter the application or sizing, our team of engineers can design the right system to meet your demands and your budget.